Subtitle: Deadly uranium is now spreading worldwide, and is threatening the survival of the whole human race. This story goes a long way to confirming our belief that the plagues foretold in the Book of Revelation are now in the world, and are beginning to take their deadly toll; they will likely reach their climax during the "appointed reign" of the coming Masonic Christ. 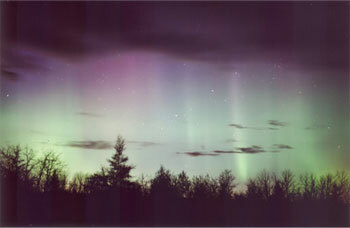 "Did you notice and behold the luminous morning and evening skies during the summer of 2005? 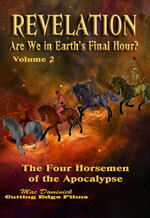 Were the brilliant and sparkling purple sunrises and sunsets over most of the North American Continent during the mid and late summer of 2005 a spectacular launch of a deadly Apocalypse over the United States and Canada? Are the purple skies of the summer of 2005 a foreboding precursor to a massive tribulation of cancer epidemics and grotesque birth defects throughout the North American Continent? After the nuclear weapons were exploded on Nagasaki and Hiroshima at the end of World War II, the sunrises, sunsets and the rain were purple for months. What made the skies purple over Japan after the nuclear attacks?" As you can see from this picture taken on June 9, 2005, over the skies of Manitoba, part of the rain falling was colored a beautiful purple. The vast majority of people -- including myself -- would never have given this purple rain much thought, for God has created this world to reflect such a wide variety of colors. However, this somber paragraph links purple rain with nuclear fallout. Can this be true? To answer this question, let us continue with our featured article. Is it true that purple "sunrises, sunsets and the rain" were visible for months after America's atomic attacks on Nagasaki and Hiroshima? This next story goes a long way to verifying this information. "On 9 September 1945, the New York Times published an eyewitness account of the Hiroshima bombing, written by William L. Laurence, the official newspaper correspondent of the Manhattan Project, who accompanied one of the three aircraft that made the bombing run. He wrote of the bomb producing a 'pillar of purple fire', out of the top of which came 'a giant mushroom that increased the height of the pillar to a total of 45,000 feet'. (A similar phenomenon can be seen in the picture of the Nagasaki bomb cloud shown above.)" From this paragraph, we learn that, when the atomic bomb exploded, eyewitnesses aboard the three aircraft accompanying the bombers noticed that a "pillar of purple fire"erupted out of the top, which then gave way to "a giant mushroom". While this article does not report that sunsets, sunsets, and rain were purple for months after the attack, but it does establish that the color purple is associated with atomic explosions. Let us now read another article on this bombing over Japan. "At 8:15 am, Hiroshima time, the Enola Gay released the nuclear bomb called “Little Boy” from its bay. The bomb was executed precisely according to schedule, right over the center of the city and made its descent. Meanwhile, the three planes quickly maneuvered their ways away from the bomb. Within 45 seconds, “Little Boy” was poised at about 600 meters above the city (Marx 168). Then the world dissolved in a "bright purple flame" (Marx 169). "Observers in the tail of our ship saw a giant ball of fire rise as though from the bowels of the earth, belching forth enormous white smoke rings. Next they saw a giant pillar of purple fire, 10,000 feet high, shooting skyward with enormous speed. By the time our ship had made another turn in the direction of the atomic explosion the pillar of purple fire had reached the level of our altitude. Only about 45 seconds had passed. Awe-struck, we watched it shoot upward like a meteor coming from the earth instead of from outer space, becoming ever more alive as it climbed skyward through the white clouds. It was no longer smoke, or dust, or even a cloud of fire. It was a living thing, a new species of being, born right before our incredulous eyes." Read the account of one of the tail gunners. "Staff Sergeant George Caron, the tail gunner, described what he saw: 'The mushroom cloud itself was a spectacular sight, a bubbling mass of purple-gray smoke and you could see it had a red core in it and everything was burning inside. . . . It looked like lava or molasses covering a whole city. 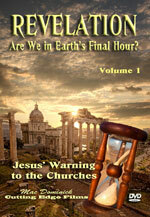 . ."
Now, let us examine an account of the atomic explosion at Nagasaki. "Those who survived the blasts became known as hibakusha (Atom Bomb Survivors). Weeks after the explosions, even those who where uninjured began to succumb to a terrible plague. Those affected would loose their hair and purple spots would erupt on their skin. Vomiting, diarrhea, and uncontrollable bleeding from the gums was followed by death. At the time the Japanese did not realize they were dying from radiation sickness..."
Notice that many of the survivors developed purple spots "erupting" on their skin! This next account reveals what researchers saw during one of the first atomic tests at Alamogordo, New Mexico, July 16, 1945. "Trinity test, a plutonium implosion device, takes place at 5:29:45 a.m. mountain war time at Alamogordo, New Mexico. It is the world's first atomic detonation. The device has a yield of 19 kilotons, which is equivalent to 19,000 tons of TNT. J. Robert Oppenheimer recalls a quote from the Bhagavad Gita, a Hindu classic: 'I am become death, the destroyer of worlds'. Brigadier General T.F. Farrell , General Groves ' deputy commander, describes the explosion in this way: 'The effects could well be called unprecedented, magnificent, beautiful, stupendous, and terrifying. The lighting effects beggared description. The whole country was lighted by a searing light with the intensity many times that of the midday sun. It was golden, purple, violet, gray, and blue. It lighted every peak, crevasse and ridge of the nearby mountain range with a clarity and beauty that cannot be described but must be seen to be imagined.."
This next story recalls an eyewitness account of a person standing on the ground when the blast went off. She was far enough from Ground Zero to escape instant death. "In an interview with The Associated Press, Hashida recalled hearing a loud metallic noise and then seeing waves of red, blue, purple and yellow light. She said she lost consciousness and awoke outside the twisted metal ruins of the factory, which had made torpedoes used in the attack on Pearl Harbor." Once again, we see the color, purple, associated with atomic explosions. However, the wording here intensifies our understanding. Whereas only the top of the atomic pillar cloud was said to be purple, this second article says that the "world dissolved in a 'bright purple flame' ". Does atomic radiation -- uranium specifically -- produce a purple color? Is this true scientifically? Let us now review the Periodic Table. 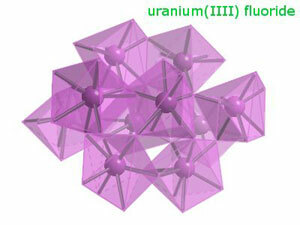 This picture shows the structure of Uranium IIII. Note that it is purple. Checking with the website, we learn the following information. 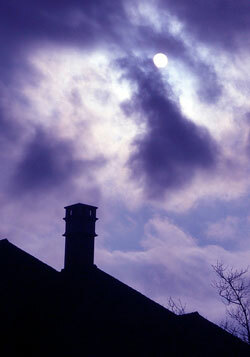 As you can see, this picture shows a purple-black coloring of the stormy night sky. This kind of sky, plus the first picture we showed you, above, are reportedly becoming more frequent all over the world, including over the North American Continent. However, is there evidence that uranium radiation from our Depleted Uranium wars in Iraq and Afghanistan reaching this far? To gain this information, we go back to our original featured article. "Tons of Uranium Oxide has been spread over Iraq and North Africa since 1990. A compound called Depleted Uranium is used in countless conventional weapons deployed by the United States military in Iraq. When the conventional weapons detonate, the Depleted Uranium becomes a fine and lethal dust called Uranium Oxide. The desert winds of North Africa keep the Uranium Oxide in the skies ... Exploding Depleted Uranium therefore creating lethal Uranium Oxide in the wind-swept and dry Sahara Desert was short-sighted, ill-advised, ridiculous, a disaster and most of all a heinous criminal act against humanity that will haunt the United States of America for decades or centuries. Please take a moment to read the articles and review the bookstore resources in our Depleted Uranium Section. Now, it is time to review how this toxic uranium dust travels from the Middle East and Northern Africa. A mainline weatherman verified that dust storms from the Middle East and Africa do, indeed, come to the United States. This CNN article confirms that, in late July, an enormous dust cloud was traveling from the Sahara Desert to the United States. "(CNN) -- An enormous cloud of dust is blowing toward the United States from the Sahara Desert in Africa, potentially creating spectacular sunrises and sunsets in Florida. CNN's Miles O'Brien discussed the phenomenon Monday with Jim Lushine, a severe weather expert with the National Weather Service in Miami, Florida." O'BRIEN: ... How frequently do you have to talk about dust clouds coming from the Sahara to Florida?" LUSHINE: We've been seeing them now for about 35 years actually looking at satellite pictures. And they're not that uncommon. They occur a half a dozen, a dozen times a year. This one is actually a fairly large one and significant one, and we're actually seeing some effects here even this morning." O'BRIEN: Tell us about the effects then. O'BRIEN: And does it just keep going, or does it settle out in Florida? What happens after Florida? LUSHINE: It generally settles out, but it does move a little farther west. Sometimes Texas can get it, sometimes other parts in the southeast United States..."
Now, let us return to our Tri-Vortex Technology article. "Sands of the Sahara Desert are made of the chemical element of Silicon therefore the colors of the sunrises and sunsets should only be the in the mid range of yellow or green. Only a chemical element such as Uranium that is the last natural chemical element on the traditional table can cause the skies to glow purple. The chemical element of Silicon in sand cannot produce purple sunrises or sunsets." Where, exactly, were purple sunsets noted in 2005? "Intense purple skies were observed in Seattle, Toronto, Phoenix, Detroit, Boston, Tampa and Dallas and all over the North American Continent ... Oddly, the cloud did not disperse over most of California." Given the fact that the Mass Media has consistently either hidden or downplayed the deadly toxic effects of Depleted Uranium dust, including how far dust travels aloft in the high wind patterns, I tend to believe that, in the past four years since Coalition Forces started blasting D.U. weapons in a very large manner all through Iraq, and continued using D.U. weapons heavily in Afghanistan, radioactive dust is now spread all the way through this world. In past months, I have seen articles in which uranium dust has been detected in Great Britain and Europe. Since we have come to believe that the Illuminati has designed numerous methods by which to kill millions of people, we do not find it hard to believe that spreading Depleted Uranium dust over all the earth is one of their insidious methods to begin the process of killing 66% of the world's population. 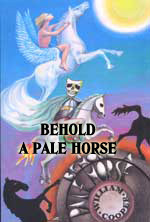 Consider some pertinent quotes from "Behold A Pale Horse". Truly, this radioactive dust is going to spread "benevolent genocide" to the entire world, as increasing numbers of people begin to die from various forms of cancers and other diseases caused or hastened by uranium in the air, the water, and the food chain. This concept is key for anyone to really understand what is happening in the world today. No member of a secret society -- be it Skull & Bones or Freemasonry -- are patriots, for they have pledged their allegiance to the globalist goal known as the New World Order. You must understand this, or many of President Bush's actions and statements cannot be reconciled. 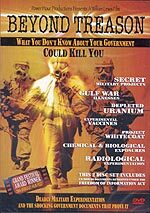 I believe that Bill Cooper's knowledge and access to Illuminati material for his book did not extend to the highest levels, for I believe the kind of nuclear attack upon which the Illuminati settled was Depleted Uranium warfare, initially launched against "select population concentrations" in the "Non-Integrating States" throughout the Middle East, primarily Muslims. Right now, we are seeing the inevitable drifting of this uranium-laced dust over the entire world -- to some degree. However, make no mistake about the reality that Islamic "Non-Integrating' peoples are the focus of this "benevolent genocide". Whenever you hear that Iraq must bear more responsibility for their own security by building up their security and their military forces, you must understand that what is occurring is that males are being pulled into the fighting. Whenever you hear of the suicide bomb atrocities, you know that both men and women are being killed; and, D.U. poisoning hits pregnant and nursing females and their babies especially hard, since the water and the food chain are polluted. Now, please note this picture, entitled, "Nuclear Winter". The fallout in the sky is colored purple. NEWS2104 - "STARTLING REVELATION: NOW WE KNOW WHY THE ILLUMINATI "TELEGRAPHS THEIR PUNCHES": FEMA's THREE PREDICTIONS, IN MOVIES AND TV SHOWS, DEPICTING THE VERY DISASTER WHICH THEY PLAN"
NEWS2076 - "SOMBER SIGNS: NATURAL OCCURRENCES NOW PARALLEL RECENT DISASTER MOVIES"
With this information as background, did the Illuminati "telegraph its punches" through the Prince song, "Purple Rain"? It's such a shame our friendship had 2 end"
"I only wanted 2 see u underneath the purple rain"
And let me guide u 2 the purple rain..."
If "purple rain" is the byproduct of nuclear radiation fallout, Prince is wishing the death sentence on his former lover. Toward the end, Prince sings something very cryptic, asking for a show of hands from his audience as to how many knew what he meant. Remember, the two most sacred numbers to the occultist is "11", which is their number for their coming Masonic Christ, and the number "13", which is their number of "extreme rebellion against constituted authority". Multiples of these two numbers are also considered equally sacred. Therefore, "13x3" is a sacred rebellion number, which is the reason Hitler began World War II in the year, 1939. Now, consider this most interesting fact concerning the original release date of Prince's album, "Purple Rain". Prince's "Purple Rain" album was released August 6, 1984. The atomic bomb was dropped on Hiroshima, Japan on August 6, 1945, thus creating months of "Purple Rain" on the city! Depleted Uranium munitions have been exploded daily since March 20, 2003, four long years ago. Some estimates of the amount of D.U. munitions which have been expended in Iraq and Afghanistan are over 4,000,000 pounds. Cutting Edge has long believed that the real reason Bush/Rumsfeld committed less than 50% of the troops the Pentagon wanted was because the war was to be fought only in order to spread deadly uranium dust over those "Non-Integrating States" throughout the Middle East. Now, apparently, the entire world is breathing some degree of this radioactive dust. And, of course, the Illuminati can cleanse themselves of this pollution through Scalar Electromagnetic Wave technology! 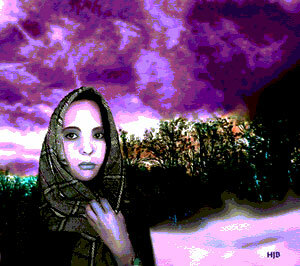 Purple Rain, Purple Sunsets, and Purple Clouds all appear to be part of the immediate future of all mankind. We believe uranium poisoning is most definitely a "huge sword", and it is encircling the planet right now! If the world stands as close to the precipice of the final world war -- the World War III planned to produce the Masonic Christ -- as we all think it does, we should be able to see some of these judgments forming on the horizon! We believe this Purple Sky phenomenon to be exactly that kind of development!